« Day 36 in Beijing: Larvae, It’s What’s For Dinner. Day 37 in Beijing: Pssst, Hey Buddy, You Want To Buy Some Bumf? Pssst, Hey Buddy, You Want To Buy Some Bumf? I was shopping at my local Wu-Mart and trying to buy some laundry detergent, dish washing liquid and other household goods that I needed. This is a simple exercise in America. I spent about 20 minutes wandering around becoming increasingly confused. Some of the attendants tried to help me to little or no avail. In reality, there are about 30 attendants that constantly ask you to buy pretty much everything they have in the store. It is customer service at its finest. I found laundry detergent but was unable to find dish washing liquid. A nice attendant could tell I was confused and stopped to help me. I started to pantomime what I needed. then I took my clothes and pretended to wash them. He nodded his head and smiled in understanding. Then I pointed to some dishes and he thought I wanted to buy them, not clean them. So maybe he wasn’t smiling in understanding. Maybe he was smiling because I looked totally goofy. Couldn’t blame him either way. This went on for about 10 minutes with about 15 people arriving to help and no one able to speak English. And me not able to speak Chinese. That is actually a bit of a rarity. I’m impressed with how many people here have a limited, or more extensive knowledge, of English. I’m also incredibly thankful for it. 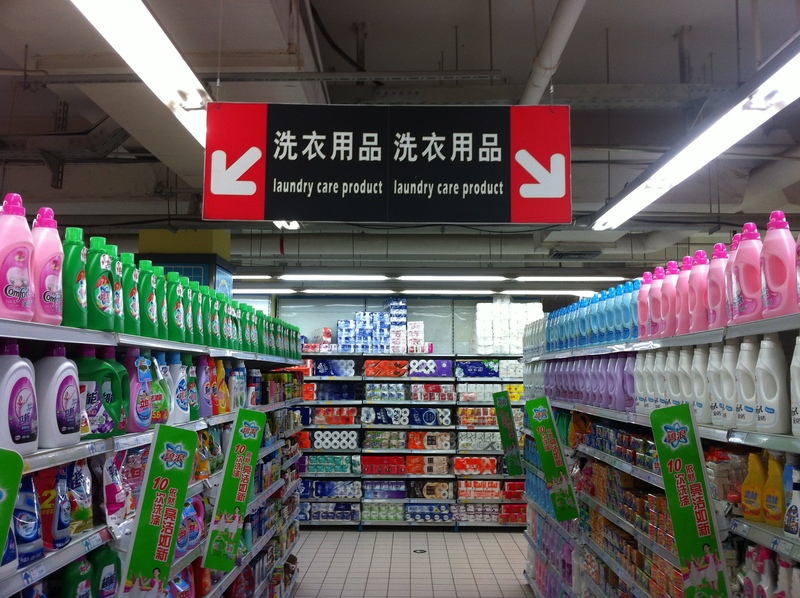 Anyway, after we decided we can’t figure it out, I just decided to keep roaming around and noticed the signs in the aisles. We have signs in grocery stores all over America so I have no idea why I didn’t think to look at them in the first place. This was going to be easy! The products were placed on the shelf accordingly. “Laundry Care Products” in easy to read English. That being said, I did find the laundry detergent. Scarily enough, it was right beside the industrial strength bathroom and kitchen cleaners. Honestly, I’m a little afraid I will be using acid on my dishes. If this is my last post, Dear Readers, then you know I made the wrong choice. As I filled up my cart I strolled down another aisle. Looking up, I noticed the sign in the aisle. 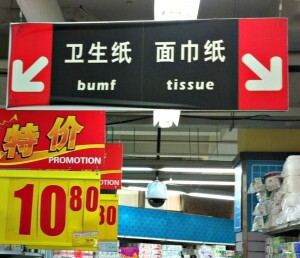 For that special time when you just need a little more “bumf” in your life.